With the 2015 Murano, Nissan is seeking out empty nesters looking to indulge a little. There was a collective gasp from the assembled crowd. 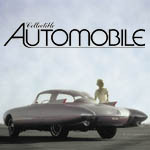 Heck … even Cadillac doesn’t admit to aiming for such an “elderly” age group. Yet indeed, neighbors of mine who have a current-generation Murano bought it in their late 40s after their only child went off to college. Nissan refers to the Murano’s cabin as a “social lounge.” It’s a pretty nice lounge, at that. Since its introduction for 2003, the Murano has stood as the style leader among Nissan’s extensive fleet of SUVs—and among SUVs in general. As an “upscale” midsize entry with 5-passenger seating, it competed against such established rivals as the Jeep Grand Cherokee, but made its mark with styling that stood out from an otherwise-conservative crowd. While 1st-generation examples look tame in today’s light, they made quite a splash when new. The 2nd generation advanced the premise, but by that time, it didn’t have quite the impact. With the new 3rd generation, which just went on sale, Nissan is again pushing the style boundries, though perhaps not as far as did the original. Murano’s styling is based on that of Nissan’s Resonance concept vehicle of a couple of years back, but it’s been expectedly toned down for production. 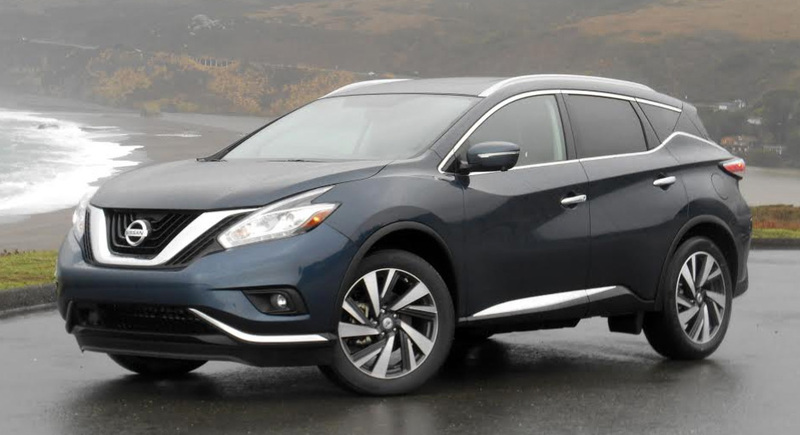 Remnants include lots of swoopy sheetmetal and a “floating” rear roofline, though the Murano’s “V-Motion” grille is a departure aimed at keeping with Nissan’s current design theme. As it has since the beginning, Murano offers just one powertrain: a 260-horsepower 3.5-liter V6 mated to a CVT automatic transmission. Front-wheel drive is standard, all-wheel drive is available. Rick found Murano’s controls refreshingly simple to use. Although the power rating is hardly impressive for a 3.5-liter engine today, it’s certainly adequate for the Murano, which lost 146 power-sapping (and fuel-sucking) pounds in the redesign. Along with some aerodynamic improvements and other fuel-saving measures, Nissan says the new Murano boasts significantly better EPA numbers (including a 20% improvement in the highway rating) that now come in at 21 city/28 highway/24 combined. While CVT transmissions are typically more efficient than a conventional automatic, many don’t present very well; they keep the engine at a steady, high speed under acceleration, which often results in magnified noise and roughness. But Murano’s combination is among the best. That’s largely due to the smooth, torquey V6 that doesn’t have to work hard under normal driving conditions, so it doesn’t have to be held at high rpms to make sufficient power. Furthermore, Nissan has programmed in some “steps” that mimic conventional gear shifts, making the CVT even more transparent. 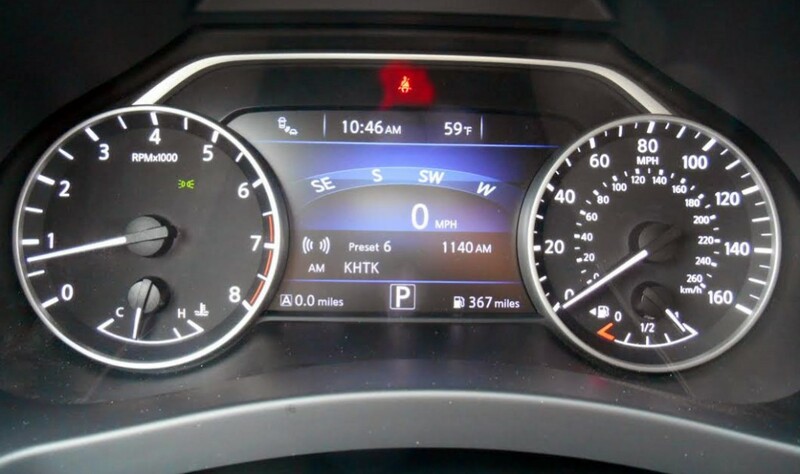 Stab the throttle from a stop, and the Murano jumps; hit it at speed, and the transmission simulates a fairly quick kickdown resulting in good passing power. Note the floating-compass direction indicator between the tachometer and speedometer. Nissan promotes the Murano as a “Social lounge,” and it does a good job living up to the billing. The ride is smooth and controlled (an evaluation admittedly formed on the comparatively smooth roads of California rather than our pockmarked Chicago ones), and noise levels from every source are low. 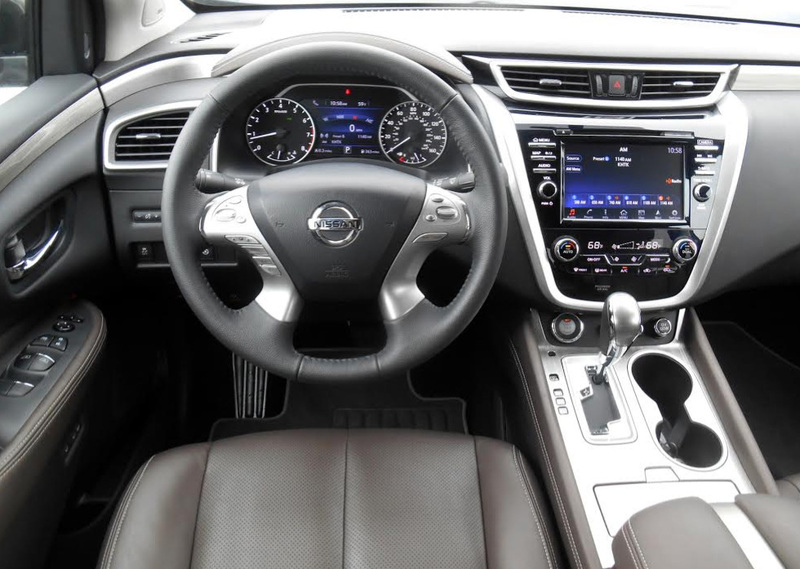 All passengers save the center rear have plenty of space and are treated to Nissan’s “Zero Gravity” seats, which we found to be exceptionally comfortable, and they can scan the skies through an available panoramic moonroof. Front-seaters can have heated and cooled seats, while those in back can have heated seats. They can also partake of Murano’s “Multi-functional Communication Alley” (yet another marketing buzz term) that includes the usual assortment of modern infotainment features. Likewise, the Murano offers the usual assortment of high-end safety features, with the rather unusual exception of lane departure warning. Niceties include “Easy-Fill Tire Alert,” which sounds a beep while inflating the tires when the proper pressure is reached. Visibility is decent to the front corners and good to the sides, but the rear corners suffer huge blind spots due to unusually thick roof pillars; thankfully, a rearview camera is standard, and Nissan’s 360-degree “Around View” camera system is available. 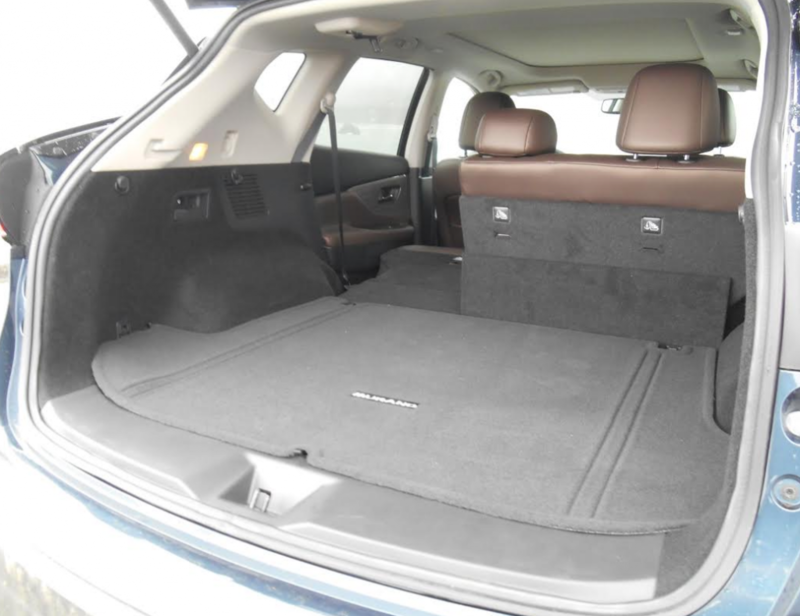 Murano’s cargo area is flat-floored and usefully cubic. As might be expected, Murano’s interior trappings match the avant garde exterior theme. Styling is swoopy but sophisticated, with lots of padded surfaces in a choice of two-tone color combinations. There are also multiple trim choices, among them seashell-look accent panels in place of the more traditional wood or brushed aluminum. Controls for the infotainment and climate systems are refreshingly simple and easy to reach, at least when compared to other high-end vehicles. 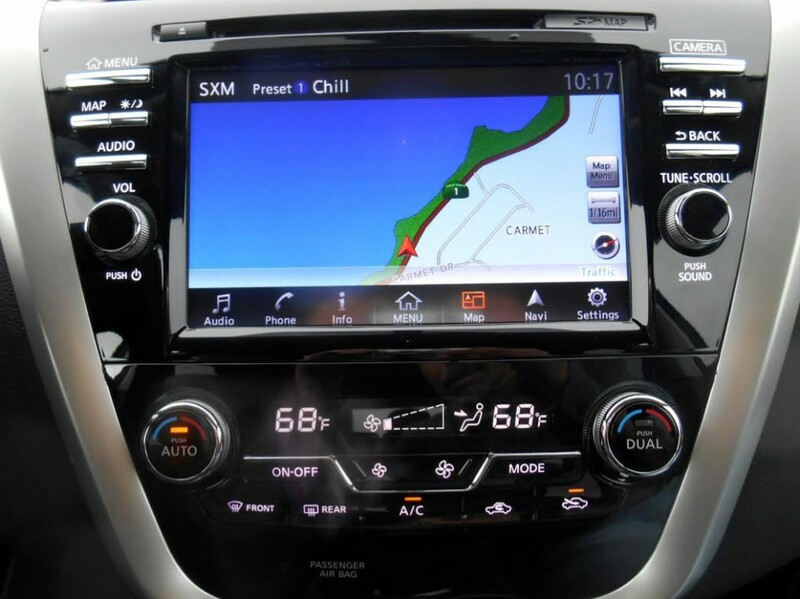 The infotainment system includes several real-life buttons and knobs (gasp) that augment other touchscreen controls. Climate is adjusted through rotary temperature knobs and less-convenient (but at least physical) repetitive-step mode and fan-speed buttons. There aren’t as many interior storage cubbies as in some SUVs, but there’s a good amount of total space. Both the glovebox and console box are quite large, and they’re augmented by a forward console bin with Aux and USB jacks, 2 open cupholders, small sliver-shaped bins on the sides of the console (which are low and rather difficult to see and access), and small map pockets in the doors. In back, the surprisingly large cargo area can be expanded by folding the rear seatbacks, which rest level with the cargo floor. In many ways, Murano goes head-to-head with some premium makes, yet keeps its prices within reason. The base front-wheel-drive S starts at about $30,500 including destination, with the mid-line (and likely most popular) SV with all-wheel drive coming in at just over $35,000. Even the line-topping Platinum with all-wheel drive starts at less than $42,000, which seems like a bargain compared to some luxury brands. Whether from behind the wheel or participating as a passenger, we found the Murano to be a great place to cover miles. Its driving dynamics leave little to be desired, and creature comforts are virtually without fault. If your left brain insists on an SUV but your right brain yearns for style, the Murano might just be the vehicle to satisfy them both. Written by: Rick Cotta on December 8, 2014.on March 22, 2019.